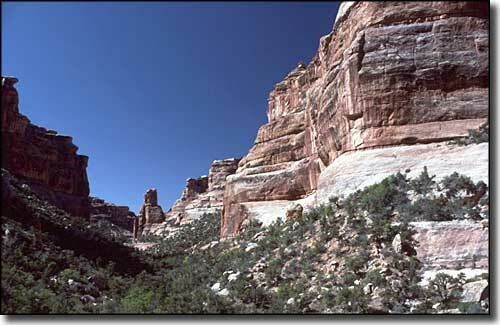 Grand Gulch Wilderness Study Area contains some 105,520 acres in western San Juan County. The property is primarily a network of winding canyons more than 190 miles in total length that are all tributary to the San Juan River. From the mesa tops you'll have views of the Henry Mountains, Navajo Mountain, Monument Valley and the Red House Cliffs. Getting to the mesa tops is not easy because of the profuse numbers of canyons, knobs, pinnacles, arches, pedestals and alcoves, all carved from the multi-colored sandstones over the millenia by the action of wind and water. Scattered across the property are extensive remains left by the Ancestral Puebloans who called this region home from about 200 CE to about 1300 CE. The various remains consist of lithic scatters, petroglyphs, pictographs, walled fireplaces, pottery shards, pithouses, towers, kivas and cliff dwellings. 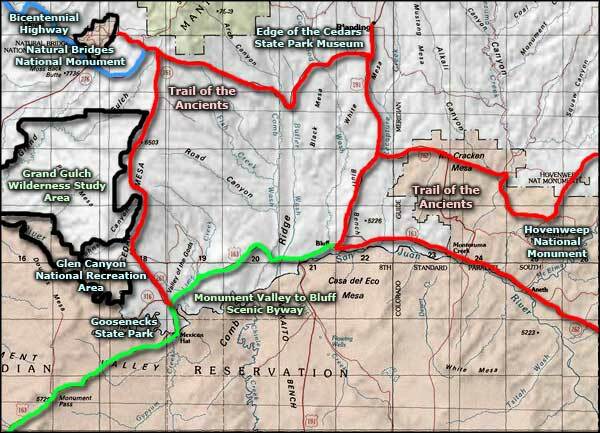 The Grand Gulch Archaeological District (4,240 acres) was placed on the National Register of Historic Places in 1982. Part of the northern boundary of the property lies along the Hole in the Rock Trail used by early settlers when they came to the area to settle in Bluff in 1879. In lower John's Canyon you'll also find the remains of the Oliver Ranch, settled by cattle ranchers in the early 1900's. Vegetation is a mix of pinyon-juniper woodlands, blackbrush and sagebrush. There is enough vegetation and water available to support populations of mule deer, bobcat, mountain lion and desert bighorn sheep. Photo of Slickhorn Canyon courtesy of G. Thomas.